Names commemorating the legendary Polynesian navigator Kupe are common in the Marlborough Sounds. Te Kupenga-a-Kupe (Kupe's net) is the cliffs on Cape Jackson, at the head of Queen Charlotte Sound, which resemble nets hung out to dry. Te Taonui-a-Kupe (Kupe's big spear), is Cape Jackson itself. 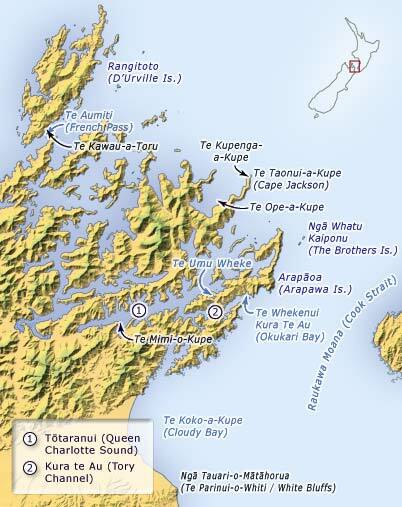 Kupe’s fight with the octopus (wheke) near Tory Channel, and the cormorant (kawau) that accompanied his companion Toru through Te Aumiti (French Pass), have also given rise to place names.